Georgian police have arrested a priest suspected of plotting to poison a top figure in the Georgian Orthodox Church. Prosecutors said cyanide was found in Fr Giorgi Mamaladze’s luggage when he was detained at Tblisi airport on Friday, before he could fly to Germany. 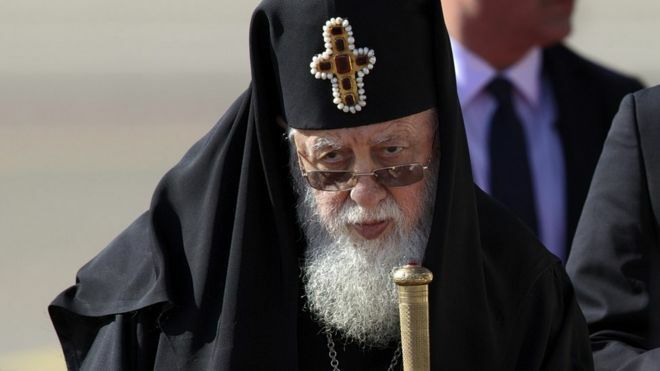 The head of the Georgian Church, Patriarch Ilia II, is being treated in hospital in Germany. Ilia might have been the target, but that is not clear. The government said Georgia had “averted a major disaster”. “A treacherous attack on the Church has been prevented,” said Prime Minister Giorgi Kvirikashvili. The patriarch underwent successful gallbladder surgery on Monday. Fr Mamaladze heads the Church’s property department and manages a medical centre in Georgia. Speaking on Georgian Rustavi-2 TV, Prosecutor-General Irakli Shotadze said a home-made gun was found when police searched Fr Mamaladze’s home. The priest had asked someone – not identified – to sell him cyanide, and that person had tipped off the police, Mr Shotadze said. Patriarch Ilia, 84, has run the Georgian Orthodox Church since 1977. Repressed in Soviet times, the Church has enjoyed a big revival since Georgian independence in 1991. More than 80% of Georgia’s 4.5m people call themselves Orthodox Christians, according to census figures.